This has been a long week. The emotions that have stirred around the recent election and more surprisingly, the outpouring of hurtful words and actions on social media sat heavy on my heart. I think I found it more difficult because in the midst of it all, I’ve been reading a book that is all about becoming a more “intentional” listener and making a difference in the world with intentional acts of kindness. My hubby and I decided that we’d end our work week with dinner and a movie. As it was Veteran’s Day, we decided to honor our beloved Veterans and see Mel Gibson’s new movie, Hacksaw Ridge. I wasn’t prepared for what this movie would stir inside of me; a sense that we are losing grip of an honor and devotion that is simply not understood anymore. Every week I turn on the tv and watch one of my police dramas where someone is inevitably shot and an investigation pursues. As a parent I’ve had discussions with my kids about how desensitized each generation becomes with more and more exposure to things that are harsh and evil. Embarrassed, I too have found myself becoming desensitized to these things. Our family is patriotic, we respect our military and our Veterans, but still, tonight, I did more than see a movie – I felt the raw emotion, and extreme bravery of those who protect us. I wept as I imagined my father-in-law, at 17 years old, in the midst of this brutal chaos. At every pounding of mortar blasts, I repeated “THIS was done for me”. Bravery doesn’t mean you aren’t afraid – it is what happens when you push through that fear. My mind took me back to this memory. 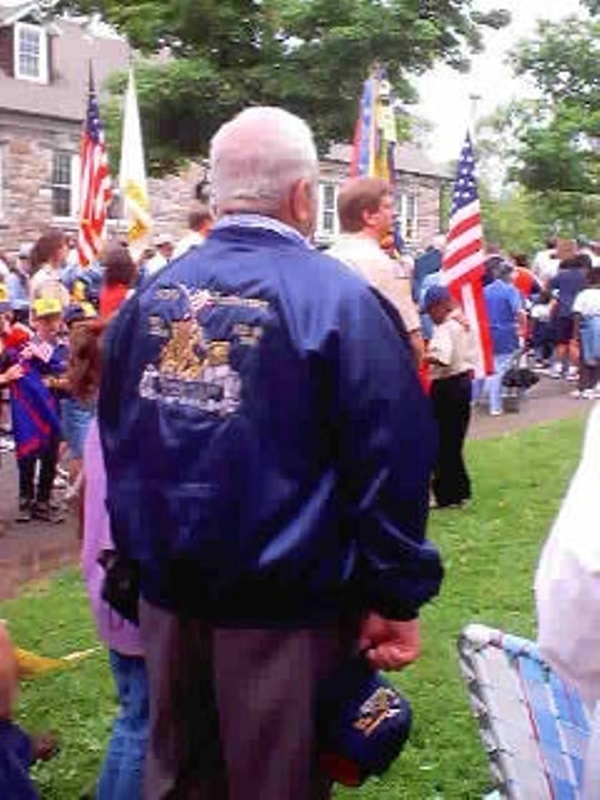 I captured this picture of my father-in-law at one of our local parades. He quietly removed his hat for the National Anthem. It touched my heart, but looking back I guess I really didn’t understand the depth behind this simple act of respect. He was one of a few Veterans there that day. Most of the crowd enjoyed the music from the parade and quickly dispersed. How many Veteran or Memorial events have we been to where the crowds are so few? Where kids laugh at the only old man singing the anthem? Where are the stories? What legacy are we handing down to the next generation? My father-in-law didn’t talk about the war, but he talked about our country, about the military, and about how easily Veterans are forgotten. We lost Pop in 2014 and the sting is as fresh as it was the day he passed. Our biggest regret is that we never got to take him to the Iwo Jima Memorial in Washington. My husband wanted so badly to make this trip with him and never got to. I look at NFL players on their knees during the National Anthem, college students stomping on and rioters burning our flag and I can only imagine the pain and disrespect felt by our Veterans. What was it all for? What good will they have done if we don’t teach our kids what is worth fighting for and standing up for. As I watched what a few hours in a soldiers life looks like tonight and I think of how important it was for these brave men and women to raise the American flag at the end of the day, how can we have anything but respect for them? Our flag is a symbol of honor, not a rag. Even when tattered and torn, its honor remains. My son began a project in memory of my father-in-law that honors our Veterans and our flag – A Star From Pop. He was a good listener; an intentional listener. He heard the stories and used them to honor and heal, not to hurt and divide. There’s a lot of hatred out there this week. A lot of individuals who can’t seem to find that honor and respect for our country. And there are those of you who are perpetuating the hate and abuse with their words. Please make the time this weekend to see this movie. It’s not easy to watch, but then again most things worth doing aren’t always easy. Try and remember that those men and women are our fathers, brothers, sisters, sons and daughters and after their day of work, they pushed through the pain, got OFF their knees and raised that flag for freedom – yours and mine. Next Post: DID YOU SCATTER KINDNESS ON 🌎 KINDNESS DAY?